MxToolbox is your expert on email deliverability. Our newest product, MxToolbox Delivery Center, gives you the insight you need to make email configuration changes and get your emails to your customers' inboxes. Let MxToolbox Simplify it for You! MxToolbox Delivery Center is your comprehensive service for understanding email that has been sent "From" your domain. 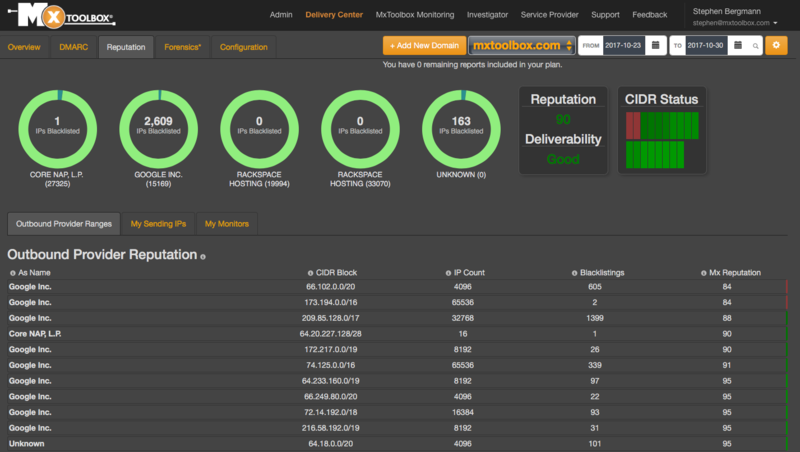 MxToolbox Delivery Center provides business-critical insight into email delivery and email sender blacklist reputation for up to 5 domains and includes 64 Standard Monitors (DNS, SMTP, HTTP, Blacklist, etc). 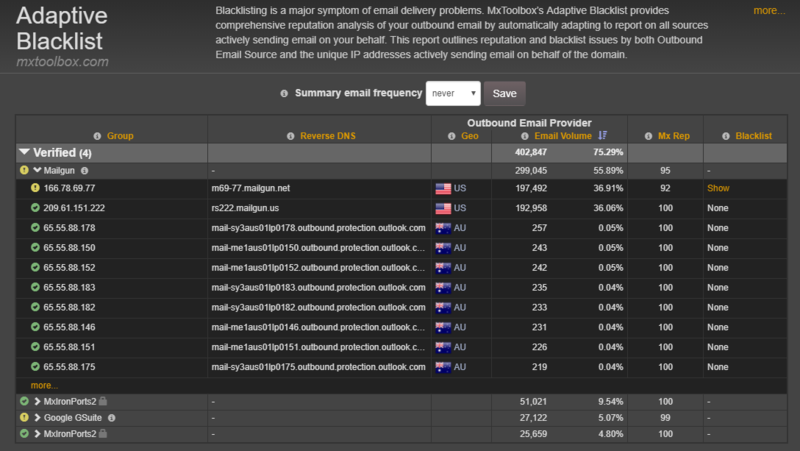 MxToolbox Delivery Center provides a complete analysis of the blacklist reputation for all of your email sending sources. No matter who is sending email on your behalf, your email reputation will be closely monitored to protect your email delivery and business from blacklisting. MxToolbox, as the experts in email delivery, have over a decade working with blacklists to ensure businesses like yours have the best email deliverability possible. Adaptive Blacklist Monitoring is the only comprehensive blacklist solution that adapts to the way you send email across all your email senders, protecting your business from one of the leading causes of email delivery failure. Regular monitoring of blacklist reputation of all your email senders. Immediate alert to changes in your email reputation. Autodetection of all your email senders. Real-time adaptation as your email senders change. Google prioritizes email from senders with proper DMARC, DKIM and SPF setups. If you aren’t monitoring your outbound email for compliance with the RFCs governing these standards, you are risking losing access to Google inboxes. That’s roughly 1 Billion inboxes you could be missing! MxToolbox Experts have created the best solution for setting up and monitoring your email delivery posture using DMARC, DKIM and SPF. 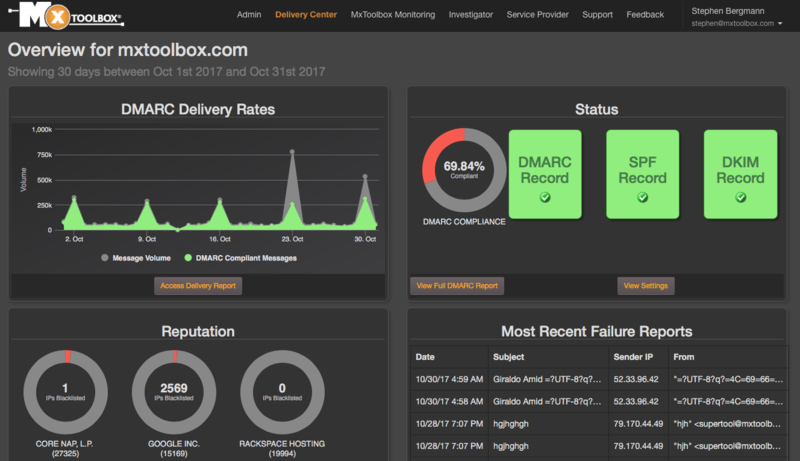 MxToolbox Delivery Center provides business-critical insight into email delivery and email sender blacklist reputation for up to 5 domains and includes 64 Standard Monitors (DNS, SMTP, HTTP, Blacklist, etc). Delivery Center gives you insight into your email delivery unlike any other product. Improve your deliverability today! MxToolbox Delivery Center has all the info you need! Delivery Center provides everything you need to confirm the proper configuration of your email delivery settings. Google is now requiring SPF records before they will deliver your email to an inbox. 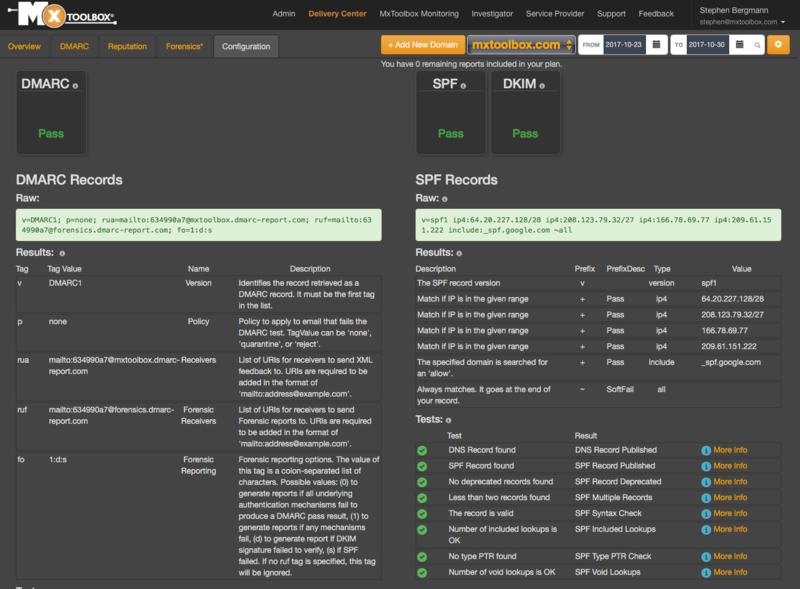 Delivery Center checks for the presence of an SPF record, decodes the record in human readable tables and analyzes it against relevant RFCs. You will know how your SPF record looks to picky receivers like Google and how much of your email is passing SPF checks. Google is also giving priority to companies that sign their email with a DKIM key. Delivery Center gives you insight into your DKIM key setup how much of your email is passing DKIM authentication. 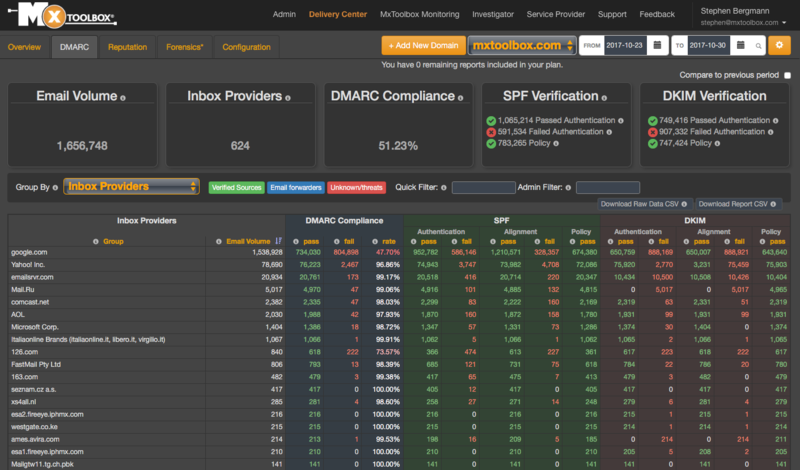 DMARC is very important for receiving feedback about potential abuse coming from your systems. With a valid DMARC setup, you can receive feedback on the reasons why your email has been refused, giving you insight into potential issues and needed changes to policy. Add Delivery Center to your DMARC records to receive the best insight into your email delivery. Mail from a blacklisted server will be automatically refused by most companies so blacklisting is an important measure of your system’s hygiene. Delivery Center will checks the servers sending mail under your domain for blacklisting to guard your online reputation. MxToolbox Delivery Center lets you know immediately when one of your servers is blacklisted and when your sending reputation is under threat. Is someone impersonating your email and ruining your reputation? Are your email hosts and mass emailing partners harming your reputation? Do you even know? If you are not monitoring your email systems and partners for delivery, you don’t know if your message is actually getting through or causing a security headache. Delivery Center has everything you need to know to protect your online email reputation!